GuideStar, CharityNavigator, and CharityWatch are a few websites that will give you an overview of an organization’s financial health and budget breakdown. Verify that it is a tax-exempt organization registered with the Internal Revenue Service by reviewing its Form 990. GiveWell does in-depth research on programs that it determines have had the most impact on people’s lives and then suggests a handful of charities it deems best at delivering these programs. Founded in 1974 by tennis legend, Billie Jean King, the Women’s Sports Foundation is dedicated to creating leaders by ensuring all girls access to sports. Girls Inc develops research-based informal education programs that encourage girls to take risks and master physical, intellectual and emotional challenges. Major programs address math and science education, pregnancy and drug abuse prevention, media literacy, economic literacy, adolescent health, violence prevention, and sports participation. Helps underfunded K-12 schools thoroughly the US become fit, athletic, and healthy by providing playground equipment, sports equipment, teacher training, and program evaluations. The Kids Fit Foundation is a national non-profit organization created to serve communities with the charitable mission to fund and provide fitness programs for at risk youth and their families. This is a global organization that uses play and exercise to educate and empower children who face adversity. It helps children build essential life skills and improve their chance for a better future all through sports. Claudio Reyna Foundation offers a variety of community engagement events designed to promote healthy/active lifestyles, to stress the importance of well visits and being proactive with healthcare, to educate families about the dangers of childhood/long-term obesity, and to empower families with the resources necessary for good health. Good Sports gives all kids the lifelong benefits of sport and physical activity by providing new equipment, apparel and footwear to those most in need. Transform recess and the school day through safe and healthy play so teachers can teach and kids can learn. KIDS In The GAME’s aim is inspiring kids to thrive in life through sports by providing the resources that get and keep kids in the game. Provides gently used and new baseball equipment for underprivileged children and adults in the U.S and the world. PeacePlayers provides programs such classroom-based education that offer formal peace and leadership education taught through the game of basketball. The on-court curriculum teaches at-risk children in South Africa, Northern Ireland, Cyprus, and Israel and the West Bank how to handle disputes by using sport as a proxy for conflict. We give everyday men and women the opportunity to fight back against cancer by training for, and competing in charity boxing events to raise money and awareness. Empowering children and youth through skateboarding and education in Afghanistan, Cambodia and South Africa. As an organization that serves refugee youth in both the United States and internationally, we have had the privilege of working with young people from more than 60 different countries. Donate new and used soccer equipment helping to redistribute items to communities that have limited access to proper gear. Charity Ball is a non-profit organization that provides new quality soccer balls to children in poverty-stricken communities around the world. Soccer in the Streets empowers underserved youth through soccer training, character development, mentoring, and employability programs. Grassroot Soccer is an adolescent health organization that leverages the power of soccer to educate, inspire, and mobilize at-risk youth in developing countries to overcome their greatest health challenges, live healthier, more productive lives, and be agents for change in their communities. The mission of SoccerGrow is to create and maintain a network of partnerships with charities, not-for-profit organizations and individuals through which SoccerPro can donate soccer equipment and money to those in need. We created an ultra-durable ball to bring the transformative power of play to the hundreds of millions of youth who don’t even have something as simple as a ball. Soccer for Peace is a non-profit organization aiming to unite children of war-torn nations in their shared love of soccer. Fights poverty and empowers underserved communities through soccer. We all want world peace, yet many kids have no ball to play with… It is a simple problem, with a simple solution. If you want to support Coaches Across Continents, you can check out their website. They don’t offer trips for families as a rule, but here are some organizations that do and some others that use sport for social good here at home. Soccer Without Borders uses soccer to support positive change all over the world. Berkshire Soccer Academy is hosting a soccer juggle fundraiser on April 30th. Read more/join in here. SquashBusters is a sports-based after-school youth enrichment program located in Boston and Lawrence, Massachusetts. We use the sport of squash, along with academic support and enrichment, community service, and college mentoring, to improve the lives of our youth and expose them to opportunities. The Mauli Ola Foundation (MOF) is a nonprofit organization dedicated to providing hope and confidence to individuals living with genetic diseases. Harnessing the healing powers of the ocean, we introduce surfing and ocean-based activities as natural therapies. We are honored to share our knowledge of the ocean, family values and community. Operation Amped’s mission is to share the “stoke” of the surfing community and the healing potential of surfing with seriously ill, injured, or disabled U.S. military veterans and their families. Helps athletes with physical challenges who do not have access to adaptive sports. Warfighter Sports has provided 10,000 wounded warriors and families opportunities to participate in more than 30 sports since 2003, free of any costs. The mission of Achilles International is to enable people with all types of disabilities to participate in mainstream running events in order to promote personal achievement. We improve the quality of life for children facing life-threatening and chronic illnesses through the power of team. Special Surfers is a non-profit organization (501c3) that provides the opportunity for special needs kids and young adults to surf. There is no cost to participants or their families, and all equipment and instruction is provided. Special Surfer events are held on the third Tuesday of each month in June, July, and August at Gooches Beach in Kennebunk, Maine. 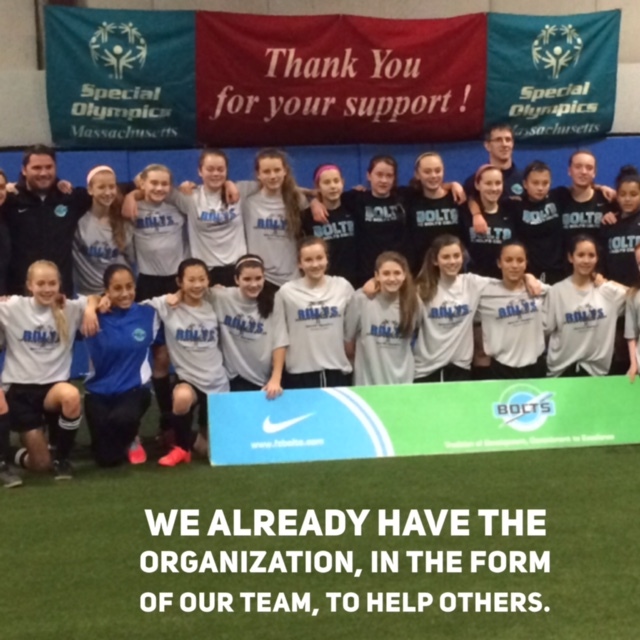 Beyond Soccer is a sports-based, youth development organization. Soccer is the means by which we engage Lawrence youth, ages 4-18, and connect them to new experiences, on and off the field, that build confidence and create opportunities for leadership, healthy living and academic achievement. This program gives NYC children the joy of summer vacation with volunteer host families and camps. Children are given the opportunity to leave the inner city and spend a summer doing outdoors activities. A youth development organization that uses soccer to engage community youth and support the South Bronx community. We serve more than 1,000 boys and girls aged 4-19 combining recreational and competitive youth soccer with academic enrichment, college prep, mentoring, health and wellness promotion, leadership development, immigrant legal services, and other social services. DREAM’s mission is to provide inner-city youth with opportunities to Play, Learn and Grow. We use the power of teams to coach, teach and inspire youth to recognize their potential and realize their dreams. GOALS advances youth leadership through soccer and education to create stronger, healthier communities in rural Haiti. Since their inception in 1985, the company has raised over $15 million dollars directly benefiting the players, parents, and coaches involved in grassroots soccer programs in each of the 50 US states and in 7 Canadian provinces. Each year Challenger Sports also donates valuable equipment, soccer balls and uniforms to many soccer based charities, schools, orphanages and missions in Central and South America and Africa.